Overall, I think that The Office’s Seventh Season is more consistent than its sixth to this point, but I do think that it has lacked any sense of direction. While there is an implied drive towards Carell’s exit that we can read into the text, the show has been telling small stories which successfully, or unsuccessfully, rely on character and situation — plot has been more or less absent, which isn’t a huge problem but has left little insight into where the show will go from here. “The Sting” offers our first glimpse of the season’s future, as Jim and Dwight encounter a rival salesman who proves suddenly vexing to Dunder Mifflin. Danny Cordray, that salesman, is not a representative of some larger corporation who can undercut Dunder Mifflin’s prices — he is simply better at it than they are, which bothers Michael about as much as you might imagine. This is something we’ve seen from Michael in the past: his prowess as a salesman is a key quality of what makes it even slightly realistic than he would ever rise to this position, and so I really liked how the episode played to that notion. When Michael is asked to step in to assist Dwight and Jim in the sale once they realize that Danny Cordray is also vying for Frames Select's business, he doesn’t do a bad job: he shows a knowledge of the client’s situation, he offers them incentives, and he even ups those incentives when the pitch isn’t working. Michael realizes that Danny simply outsold them, and that creates a volatile combination of jealousy and frustration. The plan they develop is, of course, an excuse for a giant comic setpiece. I don’t want the above to make it seem as if this story was all about deep feelings and self-reflection: with Timothy Olyphant in the role of Danny, the episode got to have a fun with his attractiveness, and the “sting” operation in Dwight’s (office building owner) office ended up being really effective from a comic perspective (and yes, that's how I say "it was funny"). What made it work is that they used secondary characters in the primary role, leaving the main characters (Michael, Dwight and Jim) to react to the situation instead of becoming part of it. Meredith’s character is more capable of playing a situation this broad without being damaged by it, and the sitcom-esque — note that there are four cameras filming the sting — story ends up being grounded in the observation on the other side of the wall. They react when Meredith goes too far, try their best to save the situation as it escalates into farce, and eventually Michael stops it when it is clear that Meredith is going to take things way too far. Note that the situation doesn’t escalate when Michael arrives: Michael puts a stop to it, and even though he doesn’t diffuse the awkwardness he does little to contribute to it. As someone who has issues with situations where Michael is either too dumb or too ignorant, this episode appeals to my sensibilities relating to the series. Michael gets his moment of redemption when he proves himself a skillful salesman, as the way Michael convinces Danny to join the company is a really artful bit of salesmanship; playing on his ambition by selling Dunder Mifflin as a better place to move forward, a place which can offer a better life, is darn intelligent. It’s particularly a great sales pitch because Dunder Mifflin is the antithesis of ambition: just look at the across-the-board response of “Stay the Same” when Michael asks his others salespeople the same question he asks Danny. Michael sells Dunder Mifflin as an opportunity, whereas for others it seems more like a last resort or, at the very least, a form of settling. What makes him so effective is that he truly believes it, more than any of his employees — it’s an honest note for the character, and a redemptive note in the grand scheme of things in terms of his competency. Sure, there’s an element of delusion in his claim that Danny should remind his employees of a young version of himself, but it’s also a romanticization of his own past, which speaks nicely to the theme in last week’s episode which landed so well. Of course, there’s really no place for Danny. The episode makes very clear that he has no real role in the series: there’s no desk, there’s no parking spot, and the long unseen Todd Packer is already the company’s traveling salesman. And, as the others salespeople point out, he might no longer be able to steal the company’s clients, but there’s every chance that he could take their clients from within. Considering that Olyphant is a regular on Justified, we know he won’t be staying around forever, but I think his transience does nothing to limit the story's effectiveness. It brings out the best in the characters: Michael’s self-reflexivity is part of this, but the most welcome change is perhaps with Dwight. 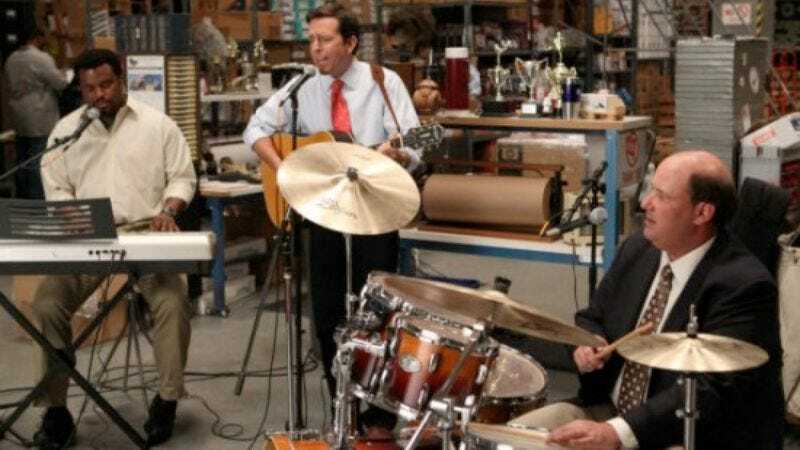 When Dwight starts tearing into Danny at episode’s end, he’s protecting the office and his co-workers; he’s also protecting himself, of course, and he does stop as soon as it’s quitting time, but there is still a decent human being there who has been absent for much of the season. 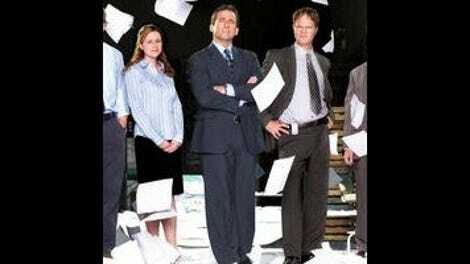 This may be a temporary storyline, but it’s a storyline that challenges Michael to do better, forces the sales team to actually try at their jobs, and brought some strong comedy as well as some honest character work along with it — temporary or not, that’s the kind of storyline the series needs at this point. And while there was little substantive within the B-Story this week, by golly Darryl and Andy make a dynamic duo. The story is quite simple, as it is more or less just an excuse to let Darryl, Andy and Kevin jam in the warehouse, but I really liked the trajectory. It’s small, but the fact that Darryl sees it first as an opportunity to make some money and eventually sees it as something fun and enjoyable is just really effective. Some may find Musician Andy a bit obnoxious, but as someone who finds it quite charming I thought it was especially so here. It was still a bit pathetic, considering the early failure in the little girl war protest song and that Andy is inspired by his friend’s local milk commercial, but eventually it becomes something quite fun. And, going back to the Lip Dub at the start of the season (which some felt was out of character for the office), I think the show earned the fun, charming tag (“Bullfrog in Love (Croak Croak Croak)”) in the initial struggle, and eventual transcendence, of the storyline. I'll admit that this wasn’t perhaps as laugh out loud funny as some other episodes in the series’ canon. However, the show’s most problematic tendencies were in check: while you could call the sting an overreaction, Danny did steal a prominent client — Scranton’s Steve Nash! - from them, and Michael kept it from escalating too far. And while Michael does act a bit selfish, like when he abandons the important meeting about Quarterlies crisis to go on the sales call, he ultimately is shown as a competent, if ultimately awkward, human being. Sometimes the show’s comedy is just an escalator to nowhere, making jokes that don’t do anything in particular. Sometimes these episodes can work, but I’ll always prefer episodes that make me laugh for a reason, and with a purpose. I think “The Sting” is one of those episodes, and is quite easily the highlight of the season to this point (for me, at least). If you don’t recognize Timothy Olyphant from anything, this means that you need to go out and purchase the Complete Series of Deadwood (which newly appointed A.V. Club TV Editor Todd VanDerWerff covered for TV Club Classic last summer) and catch up on FX’s Justified — if you watch the first few episodes of Justified and claim it is too procedural, hold your horses and keep watching. Great first season, which really comes together nicely in the end. As for Olyphant’s performance here, I quite liked it: he was very much the straight man, but I thought the moment where he threatens to punch Michael and then tries to calm himself down was really effective. In other words, he’s not just a pretty face (or shoulders, if you're Meredith Van Helsing). The cold open was ultimately silly, but it wasn’t as offensive as last week, and Michael’s can-do attitude in terms of getting on the bike spoke to the content of the episode quite nicely. Interesting moment where Dwight admonishes Jim for putting their meeting with Frames Select in terms that he thinks “they’ll” understand with his Steve Nash joke — it implies an audience, more than just the cameraman, which is quite interesting. I was afraid that the Sting was going in a predictable direction when Oscar was being sent in, so I quite liked that the obvious "Oscar is also attracted to Danny" storyline was subverted by Meredith's command of the situation. Not enough Creed in the hour, but Andy’s disappointment at Creed’s enjoyment of his song was still quite clever.